Sigh…I love spray paint so much. It’s like magic in a can. I love it so much that I wanted to find out who invented it. Taking the time to research this is proof of my love! The man who’s listed as the inventor of spray paint was named Edward Seymour and “in 1949 he added paint to existing Aerosol technology” (Wikipedia). But guess who gave him the idea??? His wife!! I smiled at my computer monitor when I read that. A woman had the idea first and her name was Bonnie Seymour. Yes siree! Do you think she was a frustrated DIY’er who was looking for an easier way to give things a makeover? Do you think she would relate to me, searching high and low for just the right living room lamps? Coveting the ceramic ones she saw online but not willing to pay the crazy prices? Do you think she would have haunted the thrift stores, hoping against hope that she might find just the right ones and then practically knocking people out of the way when she spotted this pair of beauties for only $5 each which is probably what new ones would have cost in 1949?! And do you think it would be at that moment when she would realize the full power of her idea? That a person could totally transform something like a ceramic lamp by simple shaking up a can, hearing that glorious sound of the rattling ball inside and spraying whatever color their heart desires! In this case, a beautiful, soft shade of celery green. Oh, Bonnie Seymour, you and I would have been kindred spirits. Because you saw the potential for magic when paint was put in a can. But, we know the truth. And we, and our homes, are forever grateful! P.S. The Spray Paint used for this project was Krylon Brand Indoor/Outdoor Gloss in “celery” color. 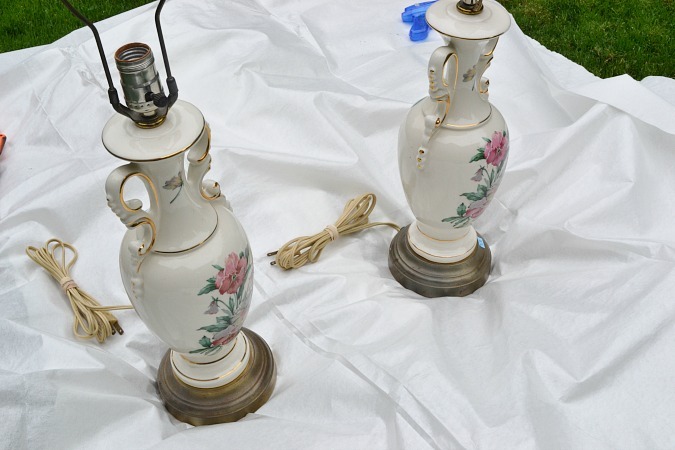 34 Comments on "Spray Painted Ceramic Lamps & Thank You Bonnie Seymour"
Those are beauties indeed. Love the color. Love the new color. Great job as always. Happy day to you rock star and your lamp is beautiful! I’m just wondering what she would have thought about Aerosol hair spray! That would have really rocked her world huh? LOL! Thanks for coming by sweet friend! May I ask the color and brand of spray paint you used? That lamp looks great, Vanessa! Such a great idea to update a lamp like that. I never think of spray painting ceramics. Well you learn something new every day! I love that and I love spray paint. 🙂 The lamp looks beautiful too! What type of spray paint did she use? I have a vase I would love to redo; but, wasn’t sure what type of spray paint. Like y’all–I love spray paint–my daughters’ always call me “THE SPRAY PAINT QUEEN”. Hi Harriet/Spray Paint Queen! 😉 I used Krylon Indoor/Outdoor Gloss Spray Paint in “Celery” color. Thanks so much for coming by! 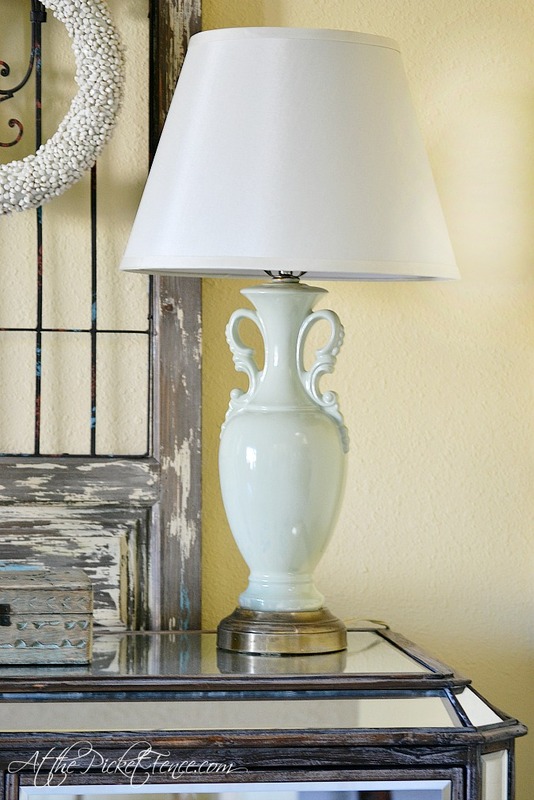 I just adore a fabulous spray painted lamp makeover! And you’ve just reminded me of a project that I need to get moving on. Oh, and it may involve spray paint. So I’ll give Bonnie a big thank you too! Spray paint is indeed a wonderful thing. I use it a lot to transform little items like toys to match my Christmas decorations. Truly an incredible invention. OMG!! I nearly fell out of my chair when I saw these lamps. I have the exact same ones!! They were my grandmothers and I love them but the roses thing just doesn’t go with anything I have. I never thought about doing this. They look completely different sprayed a solid color! Do you have a trick technique to getting the paint so smooth? On my computer, the color looks white instead of a light green but the smooth finish is what is so impressive. Any hints? Oh! I have a few of these old lamps in my online boutique and they just have not sold. I also have a couple in storage. I love spray paint and am an avid upcycler. I think I am going to have to try this on one of my old lamps. I love it! I am not a gold person but love silver. I think I will paint the base silver! Thanks for the inspiration! Oh my, Vanessa!! How beautiful?!? I see lamps like this all the time at thrift stores… and despite what I would like to call my “eye for upcycling ‘ol junk”… I would have never seen the potential in these lamps!! They turned out AMAZING!!! Vanessa, How amazing are you, and brave too! I LOVE LOVE LOVE this pos! Not for the beautiful project (which it is) but for your lovely personality that just lit up my day as I read your words. Nice to know someone else thinks like me. I bet I would have loved Bonnie Seymour too. Oh my word. Beautiful! I’ll never look at a thrift store lamp the same way again. Oh yes….I think Bonnie and I could be besties as well! 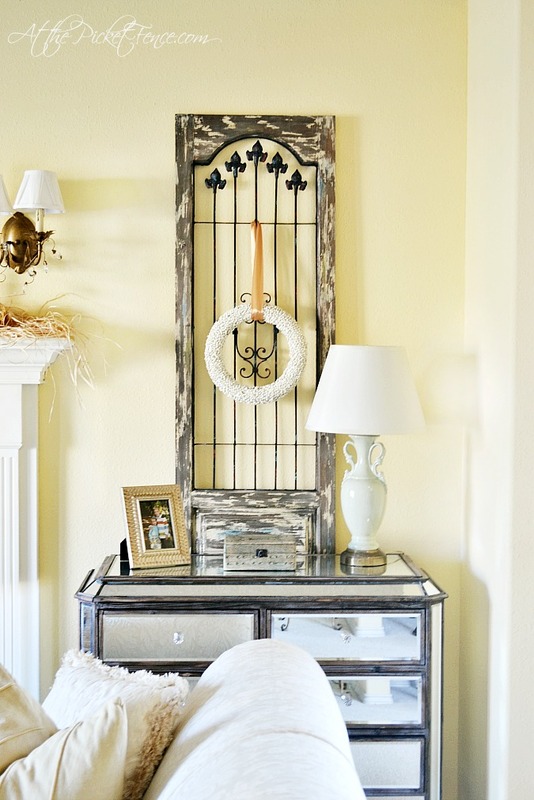 Love this redo and that color is fabulous! LOVE, LOVE, LOVE. Thanks for sharing. ok, I am going to be the negative one!!! 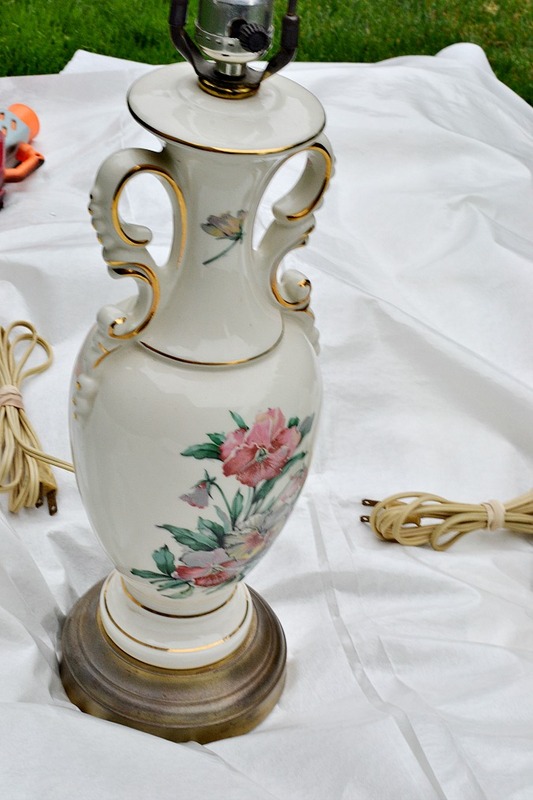 I have that same lamp handed down to me from my Mom…I really can’t imagine painting it!!!! 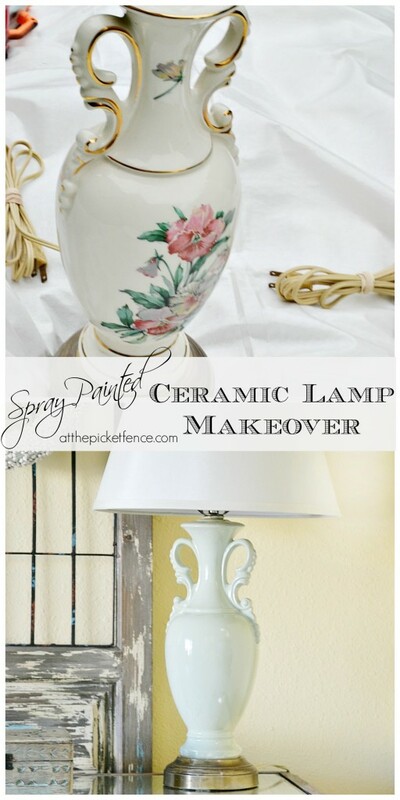 What a fantastic makeover for an outdated but still useful lamp! I’m just glad you had the nerve to go for it and shared it with us! I think I can, I think I can….and now I know how!